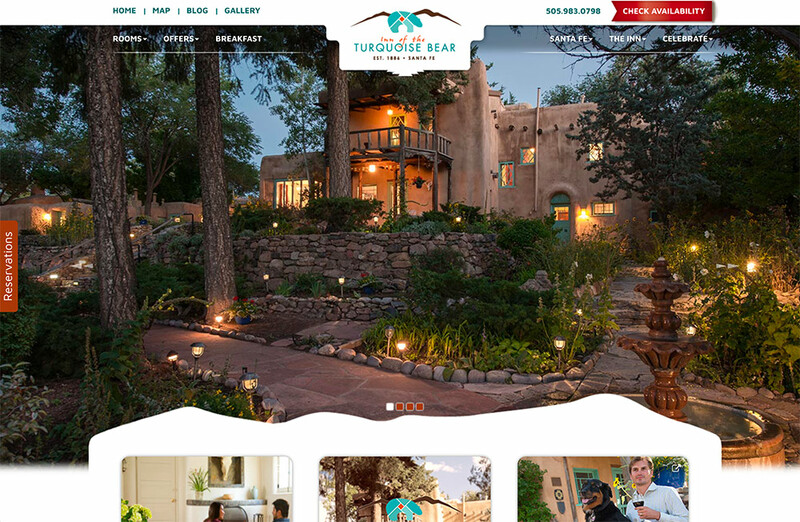 Daniel Clark, new owner of Inn of the Turquoise Bear, contacted White Stone Marketing shortly after the purchase of his beautiful Inn located in Santa Fe, NM. We knew this to be a hot market particularly for unique lodging properties, so we wanted to give him the edge as soon as possible. Our amazing client rep, Kelly Garbarino, was assigned to Dan’s account and headed out to Santa Fe to meet Dan and to help Elizabeth Campbell with the photo shoot. Often times, our staff will be on property while the photographer is also on location so that we can assist and help the project get started successfully. Kelly and Beth hit the ground running and staged all the rooms and worked tirelessly for several days to ensure Dan’s inn would stand head and shoulders above his competitors. 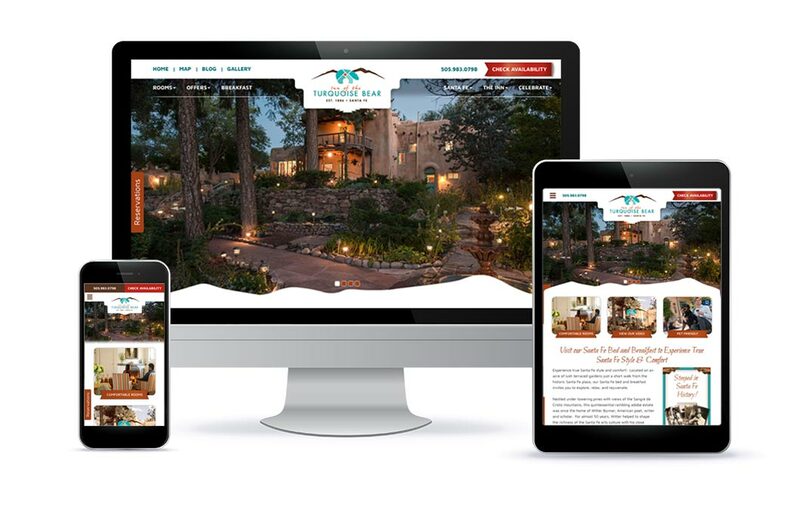 Dan even hired professional models to be on hand for the shoot to provide the personalization his site needed. 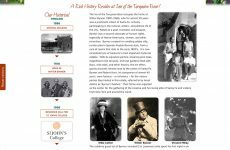 Dan entrusted us with ALL the collateral pieces for the inn – envelope, business card, letterhead, note card, and the amazing logo you see front and center at the top of the website (view print materials). 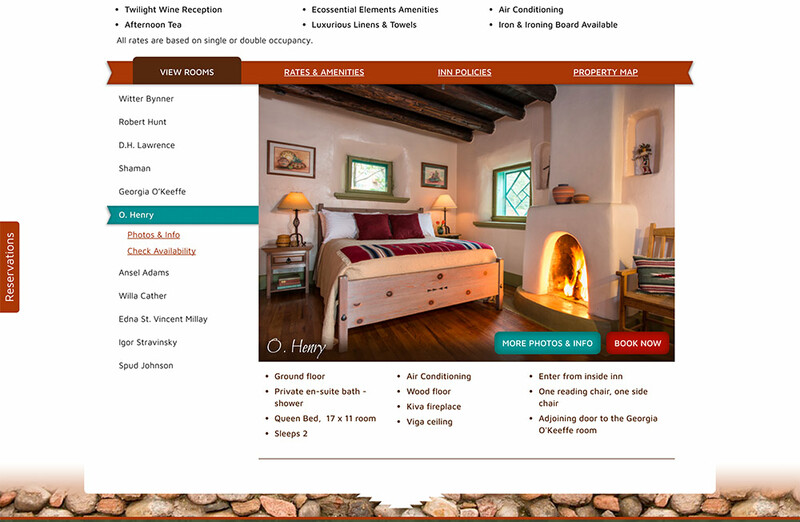 Thus, he has cohesive branding throughout the inn in both his online and offline presence. Dan has also effectively used his blog to draw attention to the inn and to the area in general and creating quite the buzz in the process! 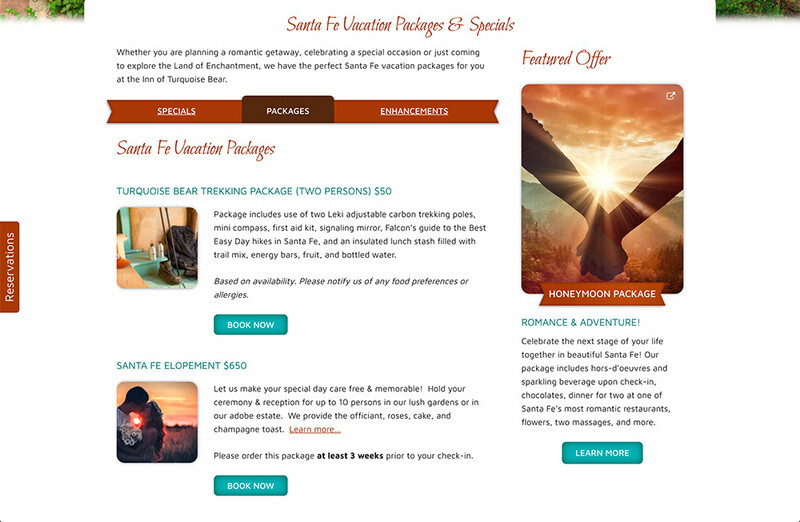 You’ll note many creative uses of the Southwestern flair added throughout the site to enhance a sense of place but also highlight the many luxurious amenities a guest will encounter during a stay in the beautiful Santa Fe bed and breakfast. Dan – Thank you for staying the course with us. I know it was a bit of a rocky start but I thank you for trusting us to provide you with the best possible product. Here’s to rising above the competition!